#WBN has been running for four years now. 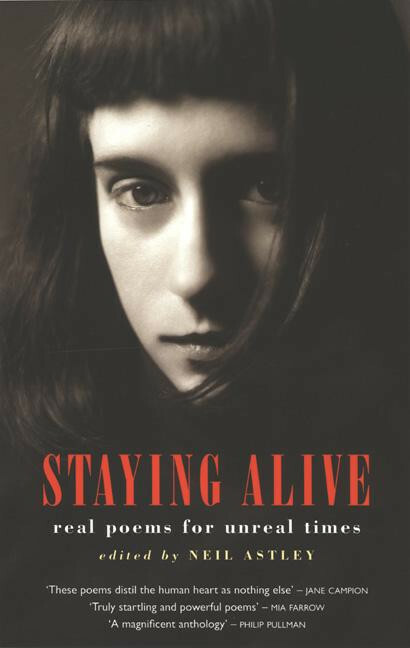 This is the third year that I have been participating and the third year that I’ll be handing out my first choice pick – this year it’s Essential Poems from the Staying Alive Trilogy. I love poetry. Before I could read – heck, before I could speak – I was surrounded by tiny tales…that rhymed! The vast majority of us are introduced to language, stories and literacy via poetry and nursery rhymes so it always surprises me when people don’t enjoy poems or see them as relevant to their lives. Deep down I believe that if the poetry you’re reading isn’t calling out to you; you probably haven’t encountered the ‘right’ poems yet! And if all you’re coming across are daffodil’s or Grecian urns (not that there’s anything wrong with the classics, but there’s a time and place! ), it’s completely understandable. Which brings me to the Staying Alive trilogy. The first book was released in 2002 with sequels in 2004 and 2011. The goal of the books was to highlight contemporary poets and poems – of pushing forward new works that speak to us all; for where we are *now*, regardless of our location, our differing experiences, … and whether we love poetry or not. The overarching theme is to reflect the differing ways in which we live in the modern world. The poems in these books are collected from all over the world, demonstrating that at our core, we are all tacking the same thoughts and issues. There are poems focusing on how we cope with identity, love, fear, wonder; to just *being* and imagining and coping with the world around us. The World Book Night compilation has selected 100 poems from the 1500 so far released in the three anthologies. Neil Astley (the editor) is at pains to note that these are not a selection of ‘best off’s’; but rather a travel companion, an opportunity to take these experiences and reflections with you as we traverse the globe. Do enjoy World Book Night, wherever you are celebrating. The aim of the whole enterprise is to get more people reading for pleasure, so even if you’re not a giver, why not recommend a book to someone you know isn’t a reader? Create an office bookshelf, join a book club, leave a book on a train or in the pub with a note saying why people should read it. And I hope that if you are lucky enough to be a giver that you have a fantastic time and remember that one of those books you give could change someone’s life. 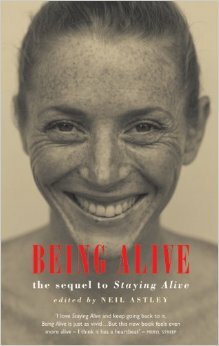 “Staying Alive”, “Being Alive” and “Being Human” have introduced many thousands of new readers to contemporary poetry, and have helped poetry lovers to discover the little known riches of world poetry. These books have been enormously popular with readers, especially as gift books and bedside companions. The poems by writers from many parts of the world have emotional power, intellectual edge and playful wit. 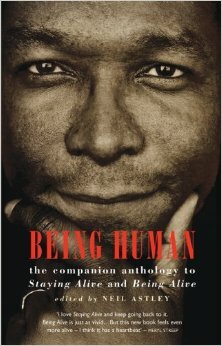 This pocketbook selection of 100 essential poems from the trilogy is a “Staying Alive” travel companion (also available as an e-book). As well as selecting favourite poems from the trilogy, readers’ and writers’ choices as well as his own favourites, editor Neil Astley provides background notes on the poets and poems. These essential poems are all about being human, being alive and staying alive: about love and loss; fear and longing; hurt and wonder; war and death; grief and suffering; birth, growing up and family; time, ageing and mortality; memory, self and identity; faith, hope and belief…all of human life in a hundred highly individual, universal poems.